Heat oven to 450°F. Remove crust from pouch; place flat on ungreased large cookie sheet or 12-inch pizza pan. Brush with 2 tablespoons melted butter. In small bowl, mix sugar and cinnamon; sprinkle evenly over pie crust. With pizza cutter or sharp knife, cut crust into 8 wedges. Bake 9 to 11 minutes or until golden brown. Cool while preparing filling. In 10-inch skillet, melt 1/4 cup butter over medium-high heat. Stir in peaches, reserved 1/4 cup peach liquid, the raisins and crème de banane. Reduce heat to medium; cook 3 minutes. Add bananas; cook 3 minutes, stirring occasionally, until bananas are thoroughly heated. 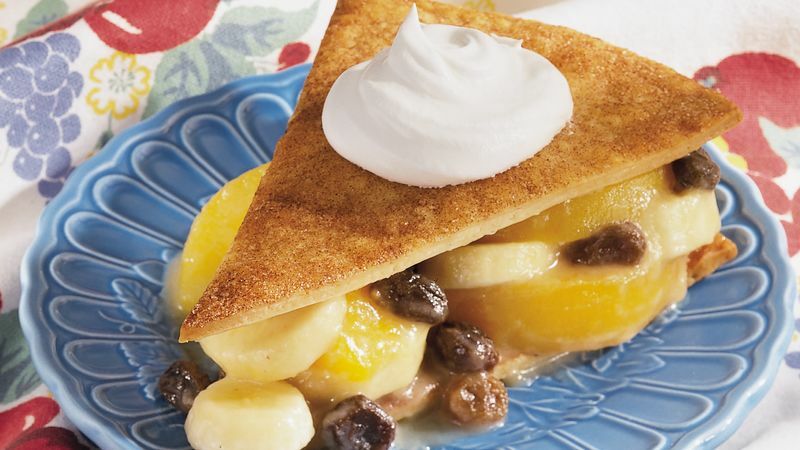 To serve, place 1 pie crust wedge, cinnamon side up, on each dessert plate. Spoon about 3/4 cup fruit mixture over each wedge. Top each with another crust wedge. Top each with 1/4 cup whipped topping. Store in refrigerator. *To substitute for crème de banane, use 1/4 teaspoon imitation banana extract plus enough liquid from peaches to make 1/4 cup.